A woman has suffered minor injuries after a car ended up on its roof in Brimington. Police were called to High Street at around 9.10am this morning. The female driver of the black Corsa suffered minor injuries. Recovery of the vehicle is due to take place this morning. 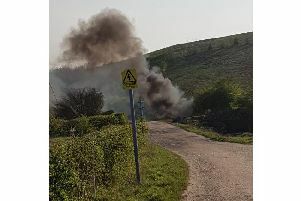 Firefighters from Dronfield and and South Yorkshire also attended the scene. The car on its roof in Brimington. Photo - Ian Andrews.